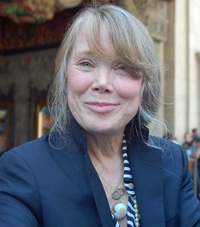 Sissy Spacek (born Mary Elizabeth Spacek; December 25, 1949) is an Academy Award-winning American actress and singer. She came to international prominence for her roles as Holly Sargis in Terrence Malick's 1973 film Badlands, and as Carrie White in Brian De Palma's 1976 horror film Carrie (based on the first novel by Stephen King) for which she earned her first Academy Award nomination. She won the Academy Award for Best Actress for her role as country star Loretta Lynn in the 1980 film Coal Miner's Daughter. She also received Oscar nominations for her roles in Missing (1982), The River (1984), Crimes of the Heart (1986) and In the Bedroom (2001). This webpage uses material from the Wikipedia article "Sissy_Spacek" and is licensed under the GNU Free Documentation License. Reality TV World is not responsible for any errors or omissions the Wikipedia article may contain.